Some runners commented that the shoe was flexible, breathable and grippy. A good number of reviewers mentioned that the Topo Athletic MT-2 was best for rod and rugged trail running sessions. According to some testers, the was comfortable and lightweight. A lot of consumers loved the roomy toe box of the shoe. Several buyers said that the shoe had an agreeable fit, especially for those who have narrow feet. Some runners experienced outsole durability issues. It easily tore apart after only several uses. A tester mentioned that the shoe retained water when soaked. It took a couple of days before it totally dried. A lot of runners were impressed with the Topo Athletic MT-2’s breathability and flexibility. It was also lightweight and comfortable to use, according to them. The roomy toe box and the secure fit also gained praise. Although some users were disappointed with the ostensibly inconsistent durability of the outsole, this shoe was still able to gain recognition as a solid option for rugged trail running activities. Oh, Topo Athletics. Where do I begin? I’ve only run in one Topo shoe before the MT2 - (UltraFly 2). In the UltraFly review, I started with a breakdown of Topo Athletics as a company and the benefit in support up and comers in the sports apparel game. This sentiment still stands. I still feel that supporting the little guy is not only a sure-fire way to guarantee you get the most “bang for your buck,” but also a way to get the big boys in the sports apparel business to take notice. That being said, if you fancy a glowing review of a Topo product, then please feel free to glance over my UltraFly 2 review. Unfortunately, I was not as impressed with the performance of the MT2 as I was with the UltraFly. The reason being; I absolutely LOVED the UltraFly. Only 3 weeks ago, I hung up my UltraFly’s in order to focus more on this review. This was great in theory, as I was approaching the MT2 with a frame of reference. Unfortunately, the UltraFly’s excellence (and conceptual focus) only served to highlight the MT2’s deficiencies. MT-2 is technically a trail shoe but is oddly stripped of the amenities of an outdoor shoe. According to Topo’s description of the MT-2, they placed a heavier focus on increasing the size of the midsole and embellishing the overlays adding to the control and support offered by the shoe. You would think that with a heavy focus on adding to the midsole, the shoe would be more comfortable. Unfortunately, the shoe doesn’t feel very cushioned. Concerning the upper, The MT2 is comfortable right out of the box. Like the upper of the UltraFly, the MT2 has a soft and lightweight upper that conforms well to your foot. The tongue is a little better padded than the UltraFly which is a welcomed addition, as the flimsy tongue was my only grievance with the UltraFly upper. This padded tongue ensures a comfortable ride, even when lacing up super tight. So, let’s get down to the various moving parts that comprise the MT-2. The shoe boasts a modest 3mm heel drop, which is, in my opinion, the perfect drop for a trail shoe. Typically, while running through the wilderness lateral support is the most important thing to me. This is mainly because the opportunity for slips and twists are numerous while running on uneven terrain. That being said, a modest heel to toe drop is actually preferable (in my opinion) for safety reasons. As minimalistic as the MT-2 might seem, I was surprised that the shoe was possessed of 23mm of cushioning. The midsole is composed of a full-length EVA midsole, but the shoe doesn’t feel that cushioned. The MT-2 is by no means an ill-cushioned shoe, but for some heavier runners, at longer distances, some discomfort may result. This is especially the case on more challenging trails. Another gripe I have with the midsole of the MT-2 is the absence of a rock plate. This is another missing feature that I would expect to be present in a more aggressive trail shoe. Once again, I find it necessary to mention that it is important to pick the trails you run on very carefully. And while personally, I didn’t suffer any injuries, the inclusion of a rock plate on a trail shoe does much for a runner's confidence. Unfortunately, it was too often a bit disconcerting running with over jagged rocks or roots with such little security underfoot. As with the UltraFly, the MT-2 has a wonderfully accommodating upper. The material is very flexible and soft, which facilitates an excellent fit. It conforms to the foot very well, almost like a slipper. I also appreciate the density of the tongue, which compared to the UltraFly is much more comfortable. One of my complaints with the UltraFly was with the “flimsiness” of the tongue, which could sometimes lead to discomfort when lacing the shoe up tightly. It is also remarkably breathable for a trail shoe, and never overheated my foot. Toe-Box is also fantastic. Wide, roomy, without feeling boxy or clumsy. I’m a big fan of the Topo toe-box design across all models. One major problem I have with the upper is that it doesn’t do much to repel rain. It does an admirable enough job repelling water in the form of dew from grass and small puddles. However, in really wet environments, the upper falters. I would have loved to have a Gortex upper in this shoe at the cost of some breathability and comfort. The upper was seemingly designed to handle the most basic impact. It serves as a really robust road shoe really. In my opinion, it was designed to tackle various terrain during the course of a single run. I call it the swiss army knife approach. In keeping with the theme of this shoe, the outsole serves well enough on a lot of different terrains. The MT2 is a general-purpose shoe, and the outsole is grippy enough to handle basic runs, but not technical terrain. If you decide to run trails, I caution you to choose your trails wisely and avoid them when it is raining. The outsole essentially serves as an extra grippy road shoe outsole, which works wonders on rainy day runs. Unfortunately, the outsole is not formidable enough to handle those tricky outdoor trails. While there is more midsole than expected in the MT2, this does not translate to a comfy shoe. The EVA midsole is stiff at first, and while it is more flexible after being broken in, it never results in a plusher ride. As a result, the impact reduction is minimal. The shoe feels like a minimalist trail shoe. I always felt myself wanting the benefits of a shoe with either more cushion or faster transitions. Speed should only suffer as a result of extra cushion and a comfortable ride. Inversely, comfort should only suffer as a result of responsiveness and speed. What results in the MT2 is a shoe that provides neither impressive comfort nor speed. If you want the shoe to excel, you are obligated into running on very specific terrain; mildly technical, flat trails. Also, I don’t feel like the shoe provides enough lateral stability. This isn’t a problem for most road shoes, as the need for control over lateral movement is minimal. However, in trail shoes, it is downright dangerous to go without mechanisms that control lateral movement. 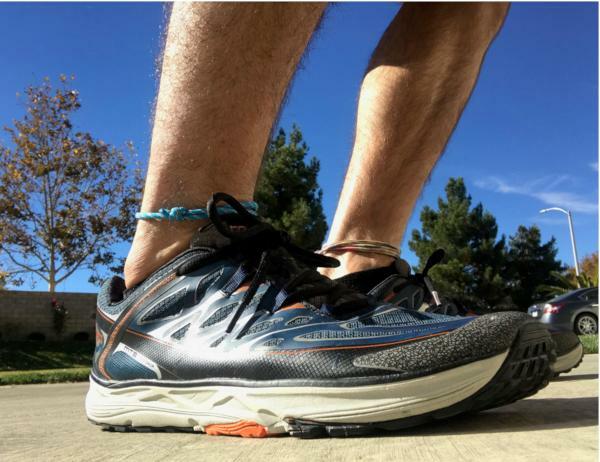 The heel is sturdy enough, and the modest drop ensures there is little lateral “back and forth.” However, I would have felt more secure on my trail runs with some extra structural support in the heel. Once again, I wish Topo would have fully committed to the MT2 being a trail shoe and provided extra lateral stability. It is really hard to recommend the MT2, as I’m not sure who I should be recommending it to. It wants to be so many different things at once and seemingly has a fear of committing to any one thing in particular. This is a shame because Topo has already proven to me that once they decide on a concept and purpose for a shoe, they excel in delivering a wonderful product. The Ultrafly was a road shoe, and never once tried to convince me that it was anything else. It was light, comfortable, and responsive. Furthermore, the Ultrafly made compromises where necessary to deliver on those things. The MT2 seemingly wants to compromise on very little, and in the process, it delivers on very little as well. The best thing I can say about the MT2 is that it’s versatile. That would be awesome if I wasn’t already a runner that knows what he wants out of his shoes. I want specific things from trail shoes, road shoes, and trainers. For this reason, I suppose that while I wasn’t crazy about the MT2, someone early in their running career would love it. It is effectively a shoe for any occasion, as long as the occasion doesn’t require excellence in any particular realm. That being said, I still love Topo as a company. I believe in the product these guys are producing, and I firmly believe that I will be buying more of their products in the near future. Unfortunately, the MT2 did not deliver for me. Hey, that’s okay! Shoot, you may love this shoe for all the reasons I did not. I guess I just wish I knew what the MT2 was designed for. I wish the shoe had an identity. I wish I knew what its purpose was. Unfortunately, without a focused concept, it’s difficult to define the purpose of a shoe. I also felt that MT-2 is little bit more responsive than version one. The MT-2 is a shoe that, with its additional cushioning, could take someone easily over the distance of a full marathon and possibly beyond and for only $100, it’s kind of a no-brainer! The MT-2 is a very simple and straightforward shoe that has been a pure joy to run in. Topo Athletic MT-2 is a low to zero-drop trail running shoe. It features multi-directional lugs that enhance traction in a wide variety of terrains. The Rubber Outsole protects the rest of the platform and provides traction. A Full-Length EVA Midsole provides cushioning and protection against impact. It also features an Ultra Light Mesh that promotes a plusher feeling. The Anatomical Toe Box allows the toes to spread naturally, essentially encouraging a more relaxed running experience. Lastly, it has a Printed Upper Pattern that provides a snugger midfoot lockdown. Topo Athletic MT-2 is a neutral running shoe and it is best for those who prefer more rugged trail activities. When it comes to sizing, it has a standard running shoe length. The available widths are D – Medium for the men’s version and B – Medium for the women’s version. Topo Athletic MT-2’s outsole is composed of multi-directional lugs that deliver traction and protection against the aggressive nature of the trails. They make sure to hold onto the surfaces, giving confidence and sure steps when tackling the great outdoors. The Rubber Outsole adds to the shoe’s durability and tenacious traction. It helps runners to accelerate on low-friction and slippery conditions. It has Flex Grooves around the metatarsal area to provide flexibility. They are designed to promote forefoot flexion, which is important when it comes to the toe-off phase of the gait cycle. The Full-Length EVA Midsole of the Topo Athletic MT-2 provides enough underfoot protection and cushioning. This helps the runner’s foot from feeling hard items that can be found on different trails. Even without the Rock Plate, the midsole is still protective and resilient. The Topo Athletic MT-2 is made up of an Ultra Light Mesh that is lightweight in structure. This material enhances breathability and comfort. It keeps the foot cool and dry during the runner’s activities. It has Polyurethane Overlays that provide structural support. They hug the entire midfoot, giving a steady and secure coverage. It has an Anatomical Toe Box, which allows the toes to splay out naturally throughout the running session.